Used to be in February all the bakeries and restaurants featured cherry pie. Do they still do that? It was to honor the legend of George Washington, the hatchet and the cherry tree. I cannot tell a lie, the story has been debunked. Shoot, why do people have to take the fun out of everything? 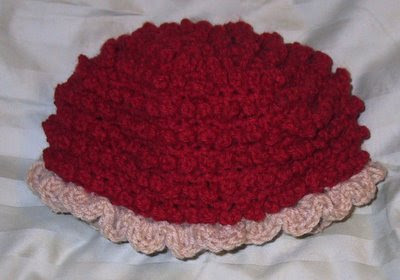 So in honor of George, the hatchet and the cherry tree, my hat for February is a cherry pie. See the fluted crust topped with a pile of cherries? Thanks go to Jo in NY for testing the pattern. 1. Read all instruction through before beginning hat. 2. Work is all done from the wrong side until the “crust”. 3. Only turn when instructions tell you to. 4. Pull slipstitches tight, you want them to almost disappear. Repeat rounds 10 and 11 until you have a total of 16 (18, 20) rounds, ending with round 10. If some how you don’t end up with 48 hdc (including the beginning ch 2) this is where you can fudge it. Instead of making a slipstitch around the beginning chain 2, slipstitch around the first true hdc. ROUND 4: Ch 2, *BPHDC around next hdc, FPHDC around next hdc. Repeat from * around. Join with a slipstitch, as if to front post, around the beginning ch 2. DO NOT turn. ROUNDS 5-6: Ch 2, *BPHDC around the BPHDC, FPHDC around the FPHDC. Repeat from * around. Join with a slipstitch, as if to front post, around the beginning ch 2. Fasten off Buff and weave in ends. I'm giving playing cards as a gift to friend who's a card playing maniac and wanted something different for her to store them. 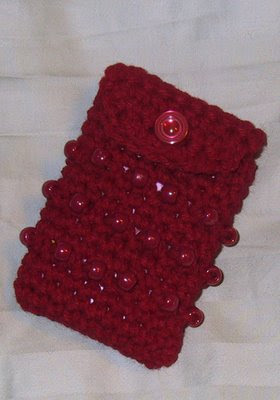 So crocheted this little case. Then I thought, for Valentine's Day this little case is just the right size for a box of Conversation Hearts. There are probably other candies that would fit as well. 2. When working in rounds, without joining, mark the start of each round with a marker. A bobby pin is a good marker. I don’t usually use a marker, I just judge it by the tail left over after crocheting round 1. String 33 beads on yarn before beginning. ROUND 16: Insert box of playing cards into case. The 15th round should come very near the top of the box. Mark the st at the right back corner of box. Remove box and sc around until 1 st before marked st. Slip stitch in that st and marked st. Ch 1, turn. Sew button under buttonhole for closure. If you want a handle on My Beaded Playing Card Case, follow the instructions on the Crayon Purse. SIZE: Approximately 8.5 inches wide and 9.5 inches tall. INSTRUCTIONS:Before beginning string 72 pony beads on yarn of your choice. I always string on a few extra, just in case I mess up on my stitch count and need another bead or two. Round 26: Ch 1, sc in loop formed by ch 1, hdc, *slipstitch in next sc, 3 sc in ch 3 loop, repeat from * around. End with slipstitch in sc, 2 sc in loop. Join with slip stitch in first sc. Ch 4, work all stitches in the first ch, 3 tr, 3 dc, ch 1, 1 tr, ch 1, 3 dc, 3 tr, chain 2, slipstitch. Ch 90, work all stitches in the fourth chain from hook, 3 tr, 3 dc, ch 1, 1 tr, ch 1, 3 dc, 3 tr, chain 2, slipstitch. Weave drawstrings through spaces made by round 25, tie ends together with an overhand knot. 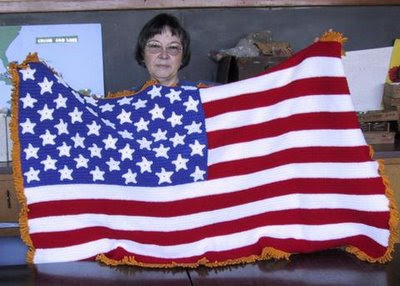 This is the star I ended up using on my flag afghan, the ones in the pattern turned out way to large to sew 50 on the blue field. 1. Read instruction completely before beginning. 2. For worsted weight yarn I used a H hook. 3. Remember to pull that slipstitch tight so that it nearly disappears. Fasten off, leaving a tail long enough for sewing the star to your project. Thanks go to Virginia for testing this pattern. Using her suggestions there are a minimum of ends to weave in. That is always a good thing. I hope you will enjoy crocheting this little sweater and hat. 3. Single crochet decrease = sc dec: Pull up a loop in the next 2 stitches, yarn over and pull through all three loops on hook at once. 4. Turning chain does not count as a stitch. 5. 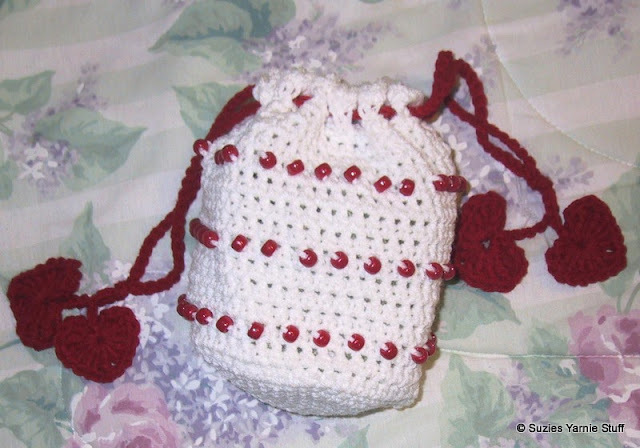 Set in photo was crocheted using LB Pound of Love. 6. 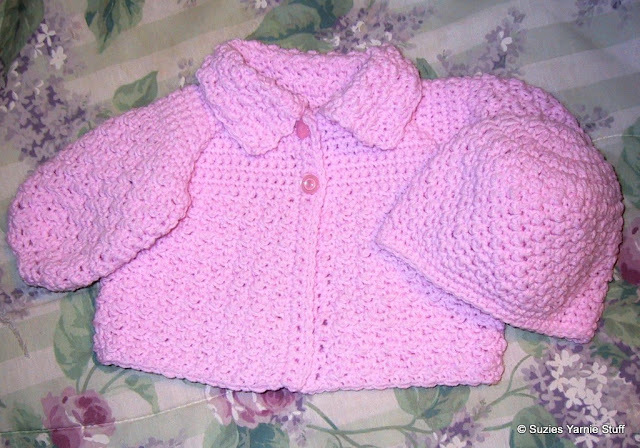 Bernat Softee Baby and an E hook worked up to a newborn size. Rows 14-28: Repeat rows 12 and 13. End with row 12. Sweater should measure approximately 9 inches from neckline. (71 sts) DO NOT fasten off. Now proceed to the button band. Rounds 4-16: Repeat round 3 until sleeve is approximately 6 inches from underarm. Do not fasten off. This is the first in what I plan to be a series of hats in 2009. 2007 it was scarves and 2008 it was bags, the links to those posts are on the right hand side of this blog. 1. Read instructions through completely before beginning. 2. Always pull joining slipstitch tight. 3. Beginning chains do not count as a stitch. 4. Links to the special stitches are at the bottom of instructions. Round 22: Ch 2, dc in each st around. Join with slipstitch in top of first dc. With black yarn and F hook, make a Magic Ring, draw up the first loop, yo, draw up another loop, yo, draw up anther loop (5 loops on hook), yo and draw through all 5 loops. Fasten off, leaving tail for sewing. Close Magic Ring tightly. Round 1: With orange yarn and F hook, make a Magic Ring and sc 4 times in ring. Do not join. Close Magic Ring tightly. Fasten off, leaving tail for sewing. Sew eyes to round 8, be careful that the line of joins on snowman are to the back. Sew nose between eyes on round 10. Sew inside of hat to round 16 of head. For scarf make a dc foundation stitch piece about 40 stitches long. Fasten off. Cut 6 pieces of yarn about 4 inches long for fringe. Fold a piece of yarn in half and pull through end of scarf, 3 on each end. Incorporate tails with the fringe knots. Trim fringe evenly. 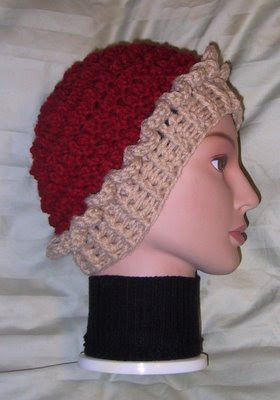 With red yarn and I hook, ch 32, for hat band. Fasten off and tie around hat. Put a small amount of Polyfil in hat and sew or glue to snowman’s head. Fold wrong sides together and slipstitch front loop of row 22 and foundation chain together, fasten off leaving a 5 inch length of yarn. Glue pom-pom to top of hat. 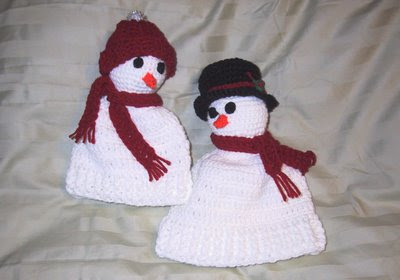 When glue is dry sew or glue hat to snowman’s head.